Online dating sites are just one of the ways that people can meet prospective partners online. In this chapter, we examine the wider online landscape around dating and relationships, and the ways in which Americans are using the internet to meet and interact with potential, current, or past love interests. Even today, the vast majority of Americans who are in a marriage, partnership, or other serious relationship say that they met their partner through offline—rather than online—means. At the same time, the proportion of online Americans who say that they met their current partner online has doubled in the last eight years. Some 6% of internet users who are in a committed relationship13 met their partner online, up from 3% of internet users who said this in 2005. On an “all-adults” basis, that means that 5% of all committed relationships in America today began online. This question was asked of everyone in a marriage or other long-term partnership, including many whose relationships were initiated well before meeting online was an option. Looking only at those committed relationships that started within the last decade, 11% say that their spouse or partner is someone they met online.14 By contrast, hardly any relationships that have existed for more than ten years had their genesis online: just 1% of Americans who have been in a committed relationship for more than ten years met their spouse or partner online. Similarly, meeting online is more common among younger age groups. 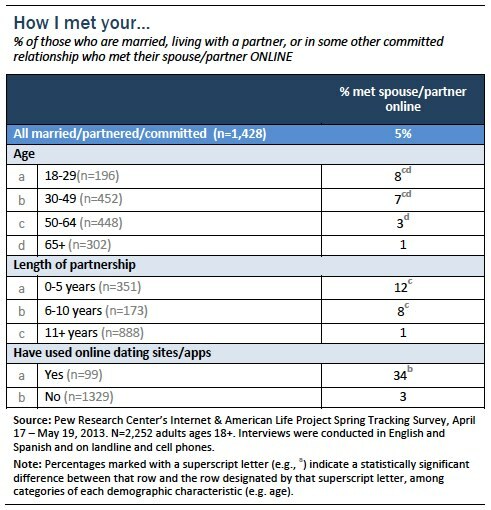 Some 8% of 18-29 year olds in a marriage or committed relationship met their partner online, compared with 7% of 30-49 year olds, 3% of 50-64 year olds, and just 1% of those 65 and older. Of course, “meeting online” might mean many things—from meeting on an online dating site, to being introduced to a friend of a friend via email, or meeting online in some other online venue not specifically oriented around dating or relationships, such as a fan forum or online gaming site. In an effort to gain more specificity on this question, we presented those individuals who met their spouse or partner online with a follow-up asking about the specific site on which they met. Around two-thirds of those who met their spouse or partner online said that they met via an online dating site, although the results are based on a small number of respondents (n=63) and are not reported here in detail. Looking at this question in a slightly different way, people who have used online dating are significantly more likely to say that their relationship began online than are those who have never used online dating. Fully 34% of Americans who are in a committed relationship and have used online dating sites or dating apps in the past say that they met their spouse or partner online, compared with 3% for those who have not used online dating sites. In our 2005 survey on dating and relationships we asked a series of questions about broad uses of the internet in the realm of dating and relationships. In our 2013 survey we repeated several of these questions and found that a number of them— such as flirting, looking up past love interests, and researching prospective partners—are now significantly more widespread than they were eight years ago. 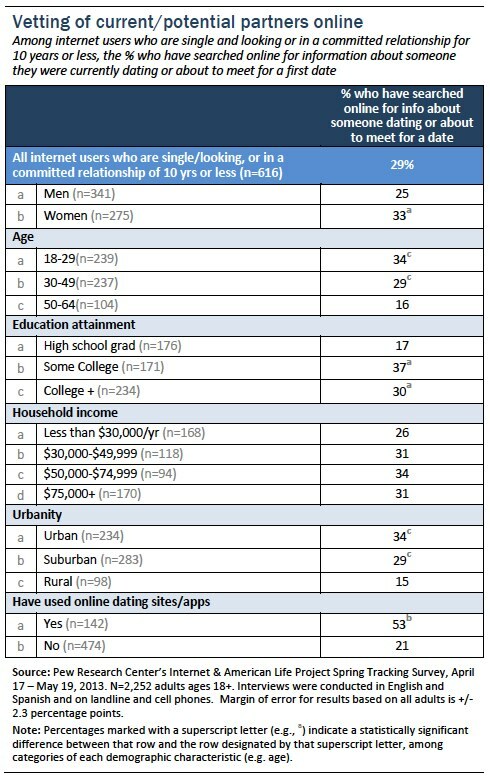 24% of internet users have searched for information online about someone they dated in the past, up from 11% in 2005. 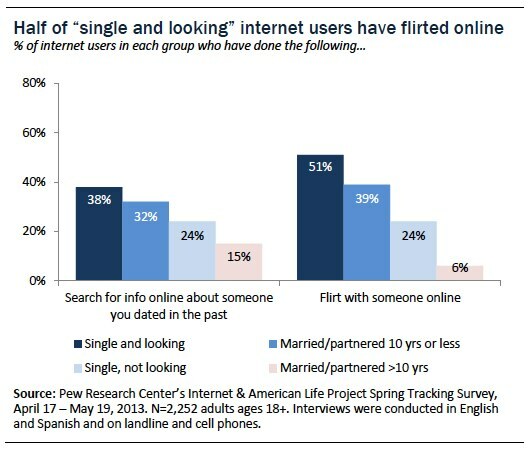 24% of internet users have flirted with someone online, up from 15% in 2005. Nearly every demographic group—men and women, young and old, the well-off and financially less secure—is more likely to take part in each of these activities than was true in 2005. However, as in our previous study, each is much more prevalent among younger age groups. 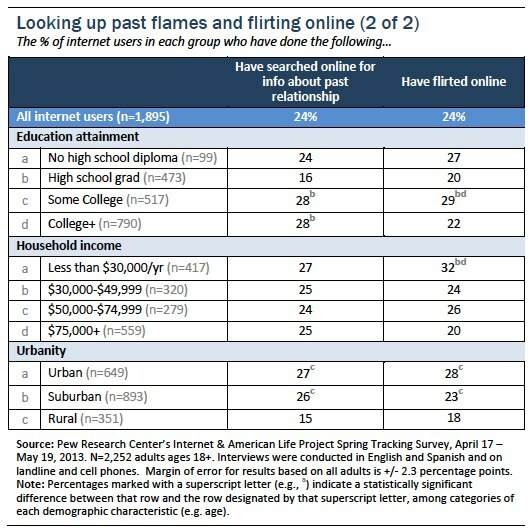 This is especially true of flirting online: Nearly half of internet users ages 18-24 (47%), and 40% of those ages 25-34, have flirted with someone online at one point or another. Looking up old flames and flirting online are also particularly common among the “single and looking,” as well as among people who have been in a serious committed relationship for a decade or less. Some 38% of singles who are actively seeking a romantic partnership have gone online to look up someone they dated in the past, as have 32% of those who have been married or partnered for a relatively short period of time. 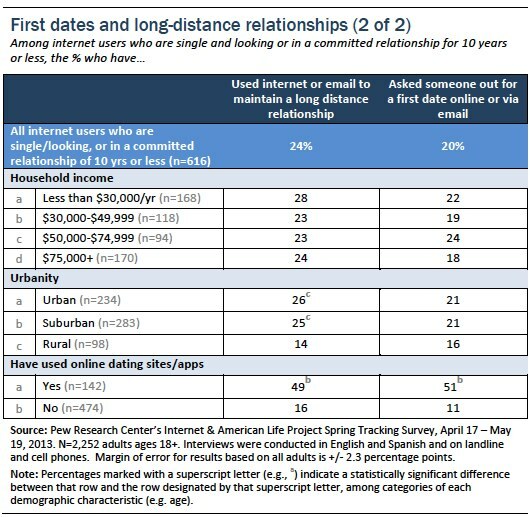 And half of the “single and looking” group (and 39% of the short-term married/partnered) have flirted with someone online—just 6% of internet users who have been in a long-term relationship for more than 10 years have done so. 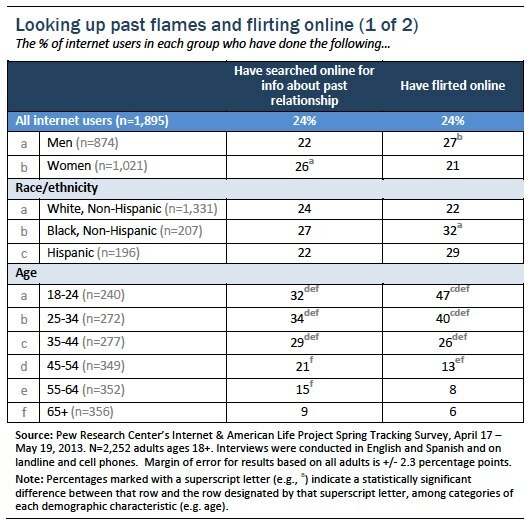 In addition to checking in on past relationships, many more Americans are now going online to research potential (or current) partners than was the case in 2005. We asked this question specifically of internet users with recent dating experience15 and found that nearly one third of these internet users (29%) have gone online to search for information online about someone they were currently dating or were about to meet for a first date. That is more than double the 13% that did so when we last asked about this behavior in 2005.16 Women are a bit more likely than men to conduct this type of research, those with a college education are more likely to do so than those who have not attended college, urban and suburbanites are more likely to do so than rural residents, and online daters are more likely to do so than non-online daters. 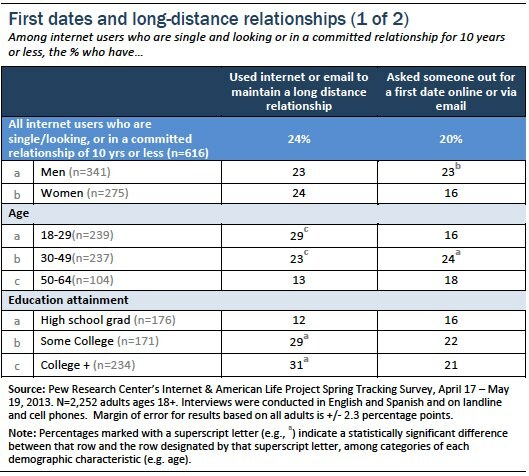 One quarter of internet users with recent dating experience (24%) have used the internet or email to maintain a long-distance romantic relationship. That figure is comparable to the 19% of such internet users who used digital tools to maintain a long-distance relationship when we first asked this question in 2005. This behavior is especially common among online daters, those who have attended college, and younger adults. A similar number (20%) have asked someone out on a first date online or via email. Men are a bit more likely to have done this than women, and online daters are much more likely to have done so than those who do not use online dating.